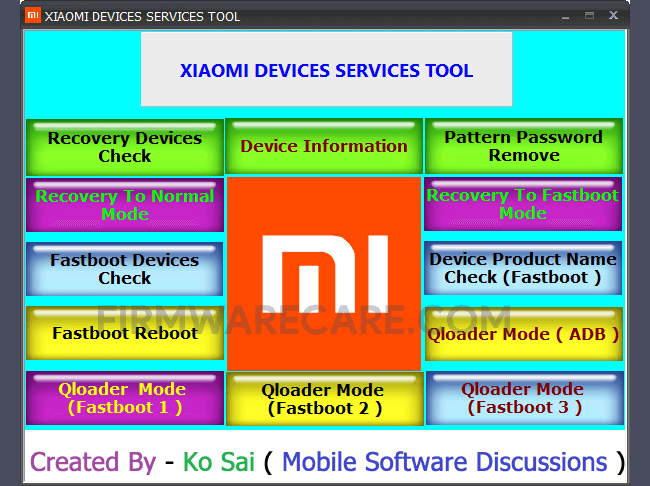 Xiaomi Devices Services Tool is a small application for windows computer created by Ko Sai, which allows you to check the device information, recovery devices check, boot from recovery to normal mode, fastboot devices check. It also allows you to reboot the android device to fastboot mode, reboot the device from fastboot mode to normal mode, Qloader Mode. It also allows you to remove the pattern lock, boot the device from recovery to fastboot mode, checking the device product name using the fastboot method, Qloader Mode using the ADB method, Qloader Mode using the Fastboot method. In order to use the Xiaomi Devices Service Tool, you need to install the Universal ADB Driver on your computer. [*] Compatibility: The Xiaomi Devices Services Tool runs perfectly on Windows XP, Windows Vista, Windows 7, Windows 8, Windows 8.1 and Windows 10 (32 bit and 64 bit). [*] Credits: Xiaomi Devices Services Tool is created and distributed by Ko Sai (developer). So, full credits goes to Ko Sai (developer) for sharing the tool for free.